Freshman and ASSU Senate Candidate Murphy Huggins knew that to stand out from his many qualified competitors he would need a fresh, new campaign. Partnered with roommate Carter Stinton, who studies visual design and knows how to use Photoshop, Huggins crafted a powerful series of poster-based advertisements that he strategically placed in key locations across campus, including the men’s bathroom on the third floor of Toyon. But Huggins could not have known the devastating effect his poster would have on Toyon resident Larry Tillman. Tillman, who in fact lives on the ground floor of Toyon, preferentially uses the bathroom on the top floor precisely because its “off the beaten track” location means he can often urinate undisturbed. Such solitude is necessary for Tillman because he suffers from a condition that afflicts 1 in every 1000 Americans, but which goes completely unrecognized and unaided at Stanford. Tillman has a shy bladder. 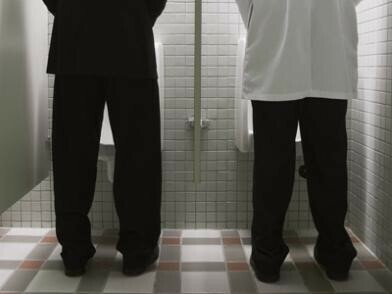 He struggles to pee at urinals, and even when a friend is speaking to him through the door of the stall or bathroom.